We are pleased to offer members the opportunity to promote your business in the AMTA Newsletter “Solutions”. 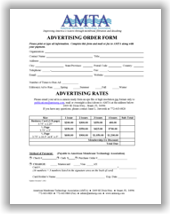 Companies interested in placing an advertisement in the AMTA Newsletter “Solutions” should submit the form below or PDF (image to the right) and return to publications@amtaorg.com. If you have any questions, please contact Alie Griffin, AMTA Publication Coordinator, at 772-463-0820. Advertisers may choose to place an ad for one (1) issue or multiple issues up to a total of four (4) within a calendar year (ads are due by March 1 for Spring, June. 1 for Summer, Sept. 1 for Fall and Dec. 1 for Winter). 1/4 page: 3.75" x 5"
1/2 page: 3.75" x 10.5"
1/2 page: 8" x 5"
Logos and artwork can be submitted in .jpg, .gif, .png, or .pdf format only. If paying by check: Make checks payable to: American Membrane Technology Association (AMTA) and mail to: 2409 SE Dixie Hwy., Stuart, FL 34996.